The piston seal lies right at the heart of hydraulic cylinder performance. Located in a groove on the outer diameter of the piston, this seal must contain the high pressure hydraulic fluid without impeding the motion of piston along the length of the cylinder. Since most hydraulic cylinders operate bi-directionally, the seal must be able to handle pressure from either side. The design of piston seals requires engineers to tread a fine line between friction and sealing performance. If the seal allows too much fluid to leak from the high pressure side of the cylinder to the low pressure side, performance is compromised. On the other hand, excessive friction on the cylinder wall leads to accelerated wear and a reduced operating life. Outright failure of a piston seal, known as blow-by, can have significant operational and safety implications, potentially causing construction or materials handling equipment to lose control of its load, for example. If the basic operating requirements weren't demanding enough, piston seals also present a significant materials engineering challenge, with hydraulic fluids at high temperatures and pressures that are tough on sealing materials and which can cause other components to expand and contract during operation. The material often chosen to meet those demands is PTFE. It has many characteristics that make it suitable for the role, including exceptionally low static and sliding friction characteristics and good chemical resistance. PTFE seals have some important limitations, however. Notably, the limited elasticity of the material means PTFE seals can be difficult to install without damage. PTFE seals require special sleeves to stretch them prior to installation, and they must then be calibrated back to the correct diameter, a process that increases time and cost for equipment manufacturers and maintenance teams alike. Furthermore, the plasticity of PTFE means the material can be reluctant to spring back into shape under continually reversing loads, which limits its sealing performance. It was a quest to overcome the disadvantages of PTFE seals that lead a team of engineers at SKF to attempt the development of an alternative sealing technology, based on the company’s well-established ECOPUR polyurethane material. 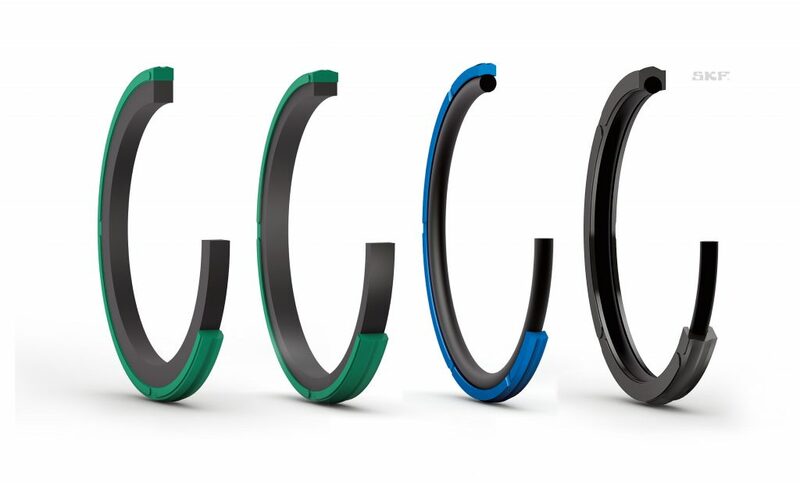 When SKF tested prototype seals manufactured from its hardest existing grade of Ecopur polyurethane, it found they weren't up to the task. Undeterred, the company took advantage of its in-house material development and manufacturing capabilities to produce a special grade of Ecopur specifically for the piston seal application. The new material – X-Ecopur PS – is the hardest grade of polyurethane currently manufactured by SKF. To test the durability of its new material, SKF performed a series of static extrusion tests, installing samples of material into a fixture that applied oil at 500bar to try and push the material through extrusion gaps of various sizes ranging from 0.15 to 0.7mm. Test samples were kept in the fixture for two weeks at temperatures of between 60 to 100º C and at the end of the test, the permanent deformation of the samples was measured. “X-Ecopur PS performed significantly better than commercially available alternatives across the full range of tests,” says Swete. With a suitable material in place, the SKF team then had to create the right sealing geometry. This was familiar territory for the company’s engineers, who have a well-established product development process that combines extensive computer simulation using finite element techniques, rapid prototype development using CNC machine tools and physical testing on custom-made static and dynamic test equipment. Further design refinements in the new seal range relate to the operation of the seal energizer. This is a softer rubber component that sits underneath polyurethane glide ring inside the piston groove, pushing the glide ring out against the inner wall of the cylinder. On light duty seals, this energizer is a simple O-ring, while designs for medium and heavy duty use a specially shaped nitrile rubber energizer. 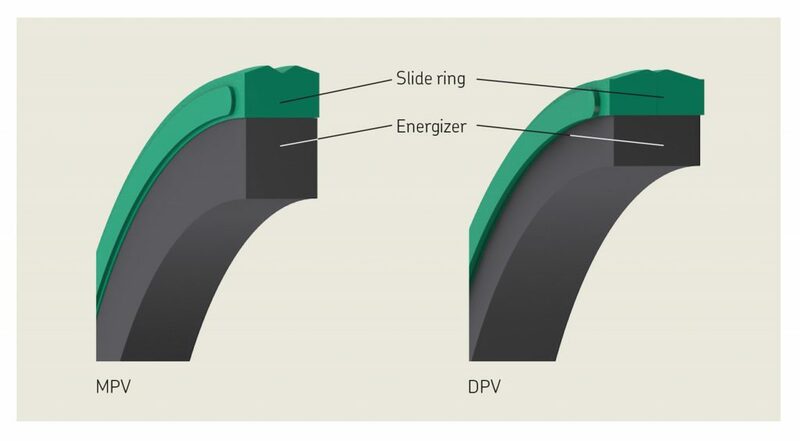 In the new SKF design, side vents are incorporated into the radial side walls of the slide ring to ensure pressure activation of the energizer. This enables the seal to rapidly shift position as the direction of pressure changes, reduce the potential for blow-by and loss of cylinder functionality. The side vents also reduce the likelihood of a pressure trap occurring when the slide ring seals against the radial walls of the seal gland, which can also result in the loss of cylinder functionality. SKF has now developed its innovative piston seal design into a full offering for a broad range of hydraulic applications. The light duty LPV range with an O-ring actuator is aimed at indoor, stationary applications like manufacturing machinery. The seals are suitable for pressures of up to 250 bar, speeds of up to 0.5 m/s and temperatures of between -20 and 100º C. The medium to heavy duty MPV range is aimed at more demanding applications such as those found in mobile agricultural and construction machinery. Sized to fit into metric-sized housings, MPV seals are suitable for pressures of up to 400 bar, speeds of up to 1 m/s and temperatures of -20 to 110º C. A third range of seals, designated DPV, offers the same operating specifications as the MPV range for inch-sized housings. Innovative piston seal design from SKF. SKF develops new hydraulic piston seals.